Since bed bugs are nocturnal and so small, detecting them can be very difficult. Signs & symptoms of a bed bug infestation can be found in bedding and on mattresses. People will sometimes roll onto bedbugs while sleeping, resulting in blood stains on the sheets. Live bed bugs will leave dark brown or black spots of dried excrement on infested surfaces after feeding and also exude a very subtle sweet, musty odour. 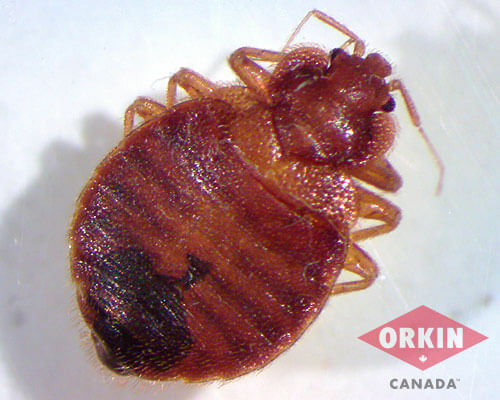 Bedbugs are small, flat and have oval-shaped bodies. They have six legs and two antennae. Bed bugs cannot fly and have short, golden coloured body hair that can make their bodies appear to be striped. 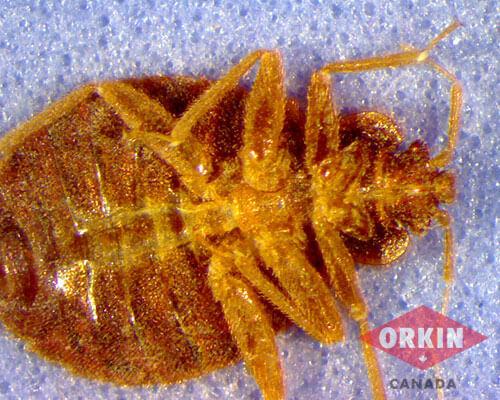 Adult bed bugs are reddish-brown in colour and approximately 5-6mm in length. 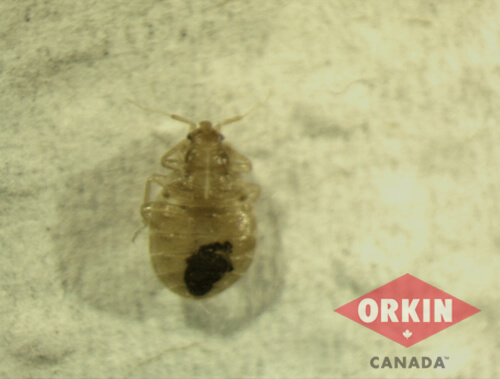 After feeding, bed bugs can swell to upwards of 10mm and get fatter and darker in colour. 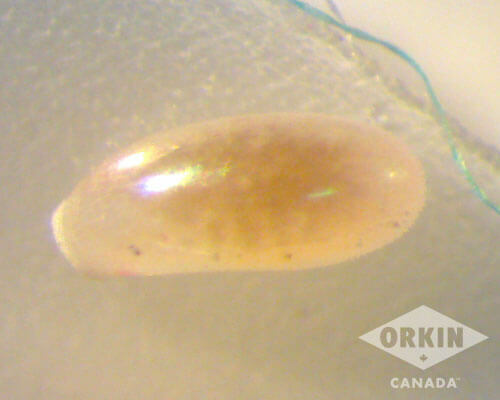 Bed bug nymphs are approximately 1-4mm in length (the size of the head of a pin) and are white or a golden colour until they feed. This light coloration acts as a camouflage and helps them hide in mattresses and carpets. Learn more about bed bug life stages. 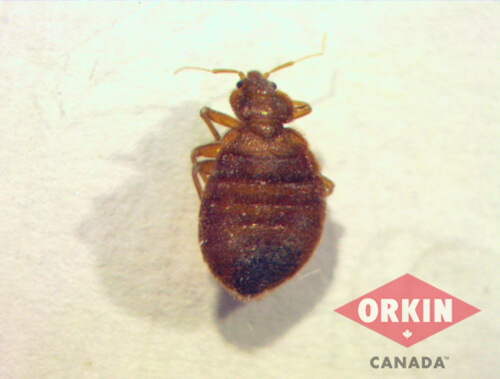 Our well-equipped laboratory helps Orkin Canada Technicians and our clients identify the exact species of pest in an infestation. 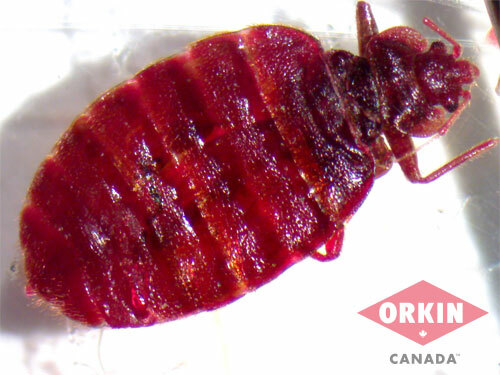 The Orkin Canada QA lab is well equipped with the latest in diagnostic and identification technology. Equipment used for analytical entomology in the QA lab includes a compound microscope with digital camera. It is capable of magnifying objects up to 1000x times and capturing images at a high resolution to assist our technicians with high defined analysis (examination) of extremely small specimens. Top view of a bed bug. 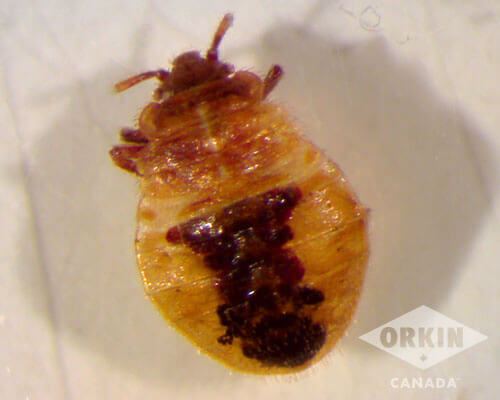 Image of a bed bug nymph. 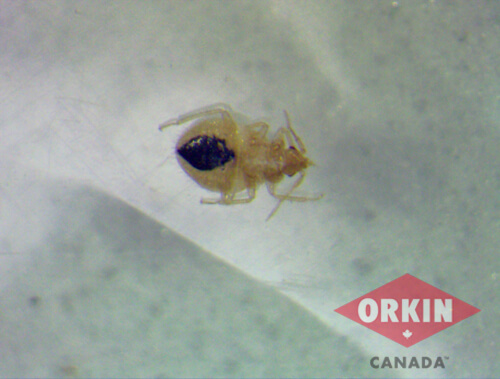 Images on this page have been taken with a compound microscope/digital camera in the Orkin Canada Quality Assurance laboratory. 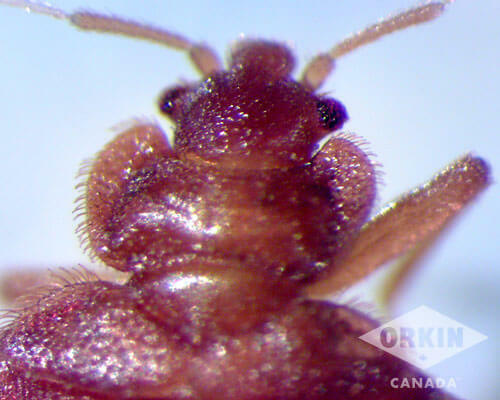 Images are property of Orkin Canada. Disturb the room further. Leaving the “scene” untouched will help Orkin Canada diagnose the problem. Take any items out of the room. Doing so will only help the bed bugs spread. Contact a professional pest control company immediately in order to inspect the infested room and/or pre-treat rooms to which any guests might be moved. In British Columbia you can only pre-treat when evidence of an infestation is found.